As Lent marches on, BACI is pleased by the response received so far on the Economic Justice study. At the end of Lent we strongly encourage all rectors, parishioners, and individuals who have used the study to fill in the short feedback form at the back of the study (also available here), and send it to us. BACI will collate and analyze the responses, which will be reported at the first BACI symposium, to the Church of Ireland, and to the ACO’s Bible in the Life of the Church project. The day will include the speakers Professor David Ford (Cambridge University), Professor Gordon McConville (Gloucestershire University), Stephen Lyon (Anglican Communion Office), the Most Reverend Dr. Michael Jackson, and the Right Reverend Michael Burrows. Ample time throughout the day will be devoted to discussion. Please spread the word and encourage all you know to come. A basic flier can be found here, and a more detailed flier here. 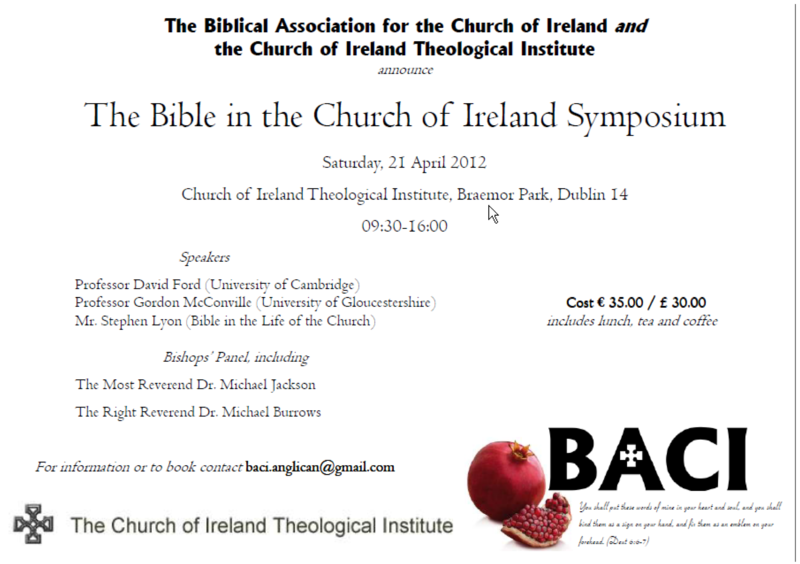 Now is also the time to start thinking about BACI’s first ever symposium on 21 April 2012, in the Church of Ireland Theological Institute, Braemor Park, Dublin. Professors David Ford and Gordon McConville, Mr Stephen Lyon, and CoI bishops will discuss “The Bible in the Church of Ireland.” The event will include tea, coffee, and lunch, all for €35. And a PDF version of the same revised symposium flier.